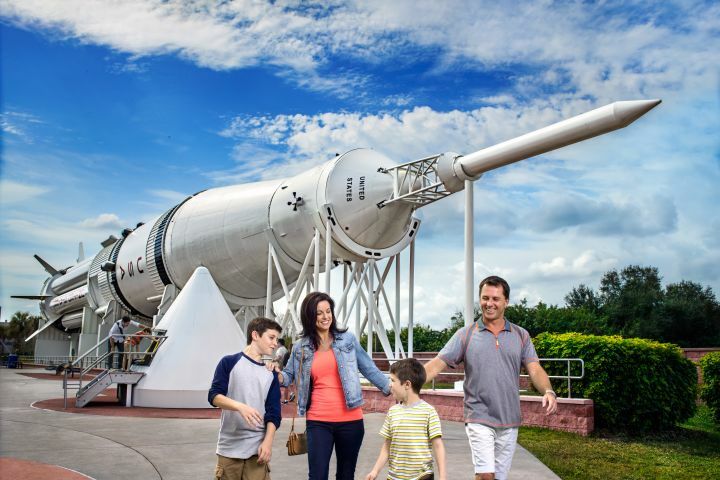 Spend the day exploring the Kennedy Space Center Visitor Complex with our full-day Kennedy Space Center tour from Orlando. We have conveniently located pick up locations in the Universal, Disney, International Dr, and Lake Buena Vista areas. Tour the NASA facility, Apollo/Saturn V Center, Launch Pads, Space Shuttle Atlantis exibit and much more. Don't miss the Astronaut Encounter, hear what it's like to be in space from veteran astronauts. Then sit back relax and enjoy a 3D IMAX space movie. Take a virtual flight with the Shuttle Launch Experience and more at one Florida's best attractions! Kennedy Space Center Visitor Complex is an out of this world destination not to be missed. NASA’s launch and landing HQ promises a day of fun and a lifetime of inspiration as you tour launch areas, meet a real astronaut, walk beneath a massive moon rocket, launch aboard the Shuttle Launch Experience and even view a live rocket launch. Options available include an airboat ride, dine with an astronaut and even a Ultimate Space Pass. Less than one hour from Orlando is NASA’s launch headquarters – the Kennedy Space Center (KSC). The Kennedy Space Center Visitor Complex offers a fascinating, behind-the-scenes look at the U.S. space program. We offer daily roundtrip bus tours to Kennedy Space Center Visitor Complex from Orlando. Our tours pick up from Central pick up locations in the Orlando, Kissimmee and Disney World area. Select your hotel from the drop down menu to find your closest pick up location. Join our professional Driver/Guide on an exciting day at KSC. No backpacks, large bags, coolers, food, or weapons allowed inside the KSC Visitor Center.